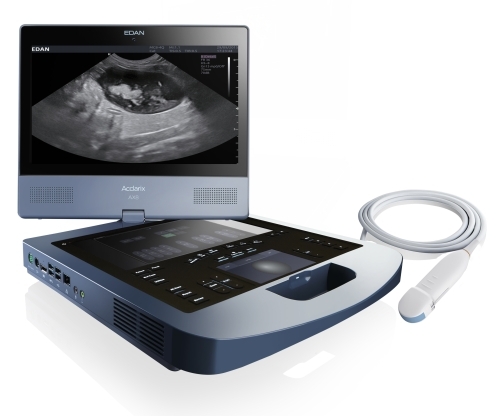 The Acclarix AX8 high end colour Doppler system for veterinary echocardiography is the latest release from Edan’s Silicon Valley-based research and development team. Adaptive B-mode and Doppler imaging, whereby the scanner compensates for phase (arrival time) errors. One study showed that this led to a 26.2% average improvement in resolution on point-like targets (Dahl et al., 2006). Speckle reduction imaging. Speckle (a result of constructive and destructive interference from backscattered echoes) creates ‘noise’ in the image, and reduces contrast, degrading the diagnostic utility of the image (Park et al., 2014). The AX8 includes a powerful algorithm to reduce speckle, without compromising on resolution.